Traces the American Revolutionary War in South Carolina - labels several battles, including Cowpens. Caroline Meridionale avec les Parties adjacentes : pour servir à l'Intelligence des mouvemens des armées Américaines. This is a 1787 Charles Picquet and David Ramsay map of South Carolina. The map depicts the region from Georgia to the Atlantic Ocean and from North Carolina to Savannah and the Atlantic Ocean. A visual summary of the American Revolutionary War in South Carolina, all the routes followed by both Patriot and British forces are illustrated and labeled. Major battles fought throughout the state are indicated by crossed cavalry swords along with the name of the battle. The Battle of Cowpens, The Battle of Kings Mountain, The Battle of Ninety-Six, and The Battle of Camden are among the labeled battles. The cities of Charleston, Camden, Georgetown, and Beaufort are labeled in South Carolina, along with Savannah in Georgia and Wilmington in North Carolina. Rivers, bays, and coastal islands are also illustrated. A key, in the upper left corner, states that the Tugoolo River and the Savannah River are the map's boundaries and notes the different notations used to illustrate villages, battles, and the movements of American and British forces. The history of the American Revolution in South Carolina is one of extremes. In 1780, when the war finally made its way to the colony, the Continental Army suffered two devastating defeats. One, at the Siege of Charleston in May, the British captured an entire American army under General Benjamin Lincoln. The other, at the Battle of Camden, which took place in August, American forces were routed by Lord Cornwallis and lost nearly half their committed forces in killed, wounded, and captured soldiers. A small victory at the Battle of Kings Mountain by the Colonial militia bought the Americans time, but South Carolina was mostly occupied by the British. Major General Nathanael Greene took command of the southern army in October. The army numbered just below 1500 present, 949 of which were Continental regulars. Even with such a small force, Greene made the unconventional choice of dividing his army, giving command of one detachment to Brigadier General Daniel Morgan. He was to take his force west of the Catawba River to raise the morale of the locals and find supplies for his men, which were limited at Greene's command post in Charlotte. Cornwallis felt threatened by Morgan's force, though he also believed that the Americans had been sent to attack a British fort at Ninety-Six (though they had not). Cornwallis dispatched Lieutenant Colonel Banastre Tarleton to defeat Morgan and his troops. While the exact number of Morgan's troops is disputed, the results of the battle are not. Morgan concocted a clever double envelopment (essentially a feigned retreat of an army's center while other forces attack the attacking army's now exposed flanks) and captured the entire British force. If Tanastre had won at Cowpens, Cornwallis may have been able to consolidate British control of South Carolina. Instead, events were set in motion that led to the end of the war. Cornwallis was forced to chase Morgan and Greene into North Carolina, where Cornwallis won a pyrrhic victory at the Battle of Guilford Court House (also illustrated on this map). Even though Cornwallis defeated Greene, the battle had so damaged his army that Cornwallis was forced to withdraw to Yorktown, Virginia. It was at Yorktown where General Washington seized the opportunity to trap and defeat Cornwallis and his army at the Battle of Yorktown. That defeat caused the British to give up the fight to retain their colonies. 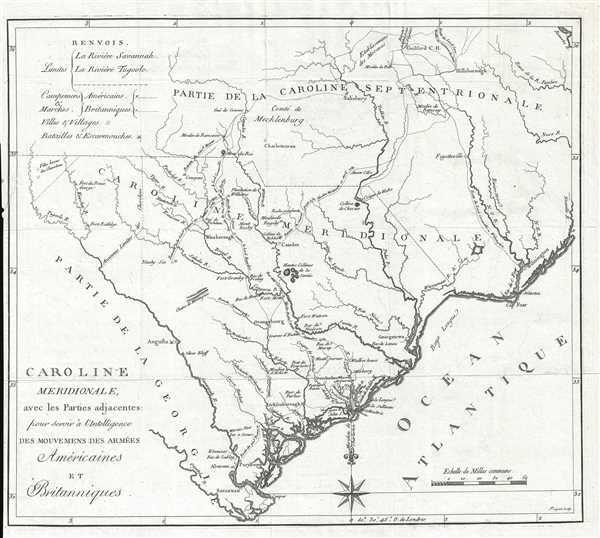 This map was issued to accompany the 1787 first French edition of David Ramsay's (1747-1815) History of the Revolution of South-Carolina or, more properly, Histoire de la Revolution d'Amerique par rapport a la Caroline Meridionale. The French edition of Ramsay's history was issued 2 years after the English edition. The map, which was originally engraved by the Charleston engraver Thomas Abernethie, has here been re-engraved in French by Charles Picquet. While cartographically similar, Piquet's engraving is more sophisticated and refined. Charles Picquet (April 15, 1771 – January 15, 1827) was a French cartographer active in Paris during the Napoleonic and post-Napoleonic Eras. Picquet was born in Romagna-sous-Montfaucon, Meuse, France. From about 1798 Picquet supplied maps to the Dépôt de la Guerre. From 1806 he was appointed to Napoleon's Cabinet Topographique. Being politically dexterous, he was able to retain this position after the fall of Napoleon under both Louis XVIII and Charles X. Under Louis XVIII he also obtained the Brevet de Géographe Ordinaire du Cabinet Topographique. He worked with the cartographer Adrien-Hubert Brué on a major atlas project. When Charles Picquet died in 1827, his son, Pierre-Jacques Picquet, continued to publish under his father's imprint name well into the middle part of the 19th century. David Ramsay (April 2, 1749 - May 8, 1815) was an American physician, public official, and historian from Charleston, South Carolina and is recognized as one of the first major historians of the American Revolution. Born In Lancaster County, Pennsylvania, Ramsay graduated from Princeton in 1765 and received a medical degree from the University of Pennsylvania in 1773. He settled in Charleston where he opened a medical practice. Ramsay served as a member of the South Carolina legislature from 1776 until 1783 and joined the South Carolina militia in 1780 as a field surgeon when the British threatened Charleston. After the fall of Charleston, Ramsay was imprisoned for nearly a year until he was exchanged. He then served as a member of the Continental Congress from 1782 until 1786, and served as its chairman from November 23, 1785 until May 12, 1786 due to the absence of John Hancock. In 1785 Ramsay published History of the Revolution in South Carolina in two volumes, which has the distinction of being the first book to receive a copyright in the United States. Ramsay also published a two-volume History of the American Revolution in 1789, Life of Washington in 1807, and a two volume History of South Carolina in 1809. Ramsay, D., Histoire de la Revolution d'Amerique par rapport a la Caroline Meridionale, (Paris) 1787. Very good. Even overall toning. Light wear along original fold lines. Blank on verso. OCLC 80618918. Nebenzahl (Biblio) #85.